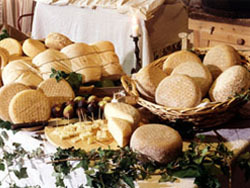 Many tour and food operators really love the food values of this kind of cheese. They presents more and more attention to the castle and the mill. 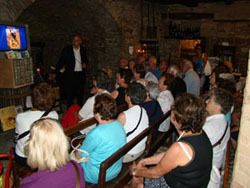 You can read the following program of a tipical cultural visit and culinary education. Rocca Malatestiana (with paintings of the fifteenth century, a beautiful landscape from Urbino to the Adriatic sea, a fossil museum and a ceramic one). The village and its historic buildings. St. Michele Arcangelo’s Church (with many pictures of G. Picchi, A. Pomarancio, G. Soleri Brancaleoni, a miraculous crucifix, ancient roman ruins of the Temple of Diana, a picture of the blessed Elisabetta Renzi and many more). The mill of Porta di Sotto with Malatestian holes, that produce a famous and prestigious cheese, including the famous Cheese Of Malatesta (the one covered with few quintal of wheat) You can also find many grinders for oil and grain, a wine press, a wine cellar, a well, an oven, a bakery, an underground exit walkways and many other interesting things. 1. Three different kind of cheese on a chopping board: d.o.p. Cheese, Malatestian cheese seasoned under the wheat, cheese of the cavern. Salami on a chopping board and many other culinary delights. And everything is free, including the castle and the mill sightseeing. 2. With few money you can have e real dining experience, and falling in love with a great cheese, honey, good italian wine, olive oil and salami. At the end you can also buy some cheese, oil, honey, wine and other local products at preferential prices. 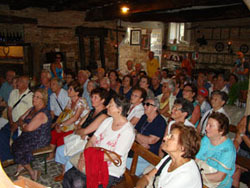 In the mill there’s a food education center and the school S. Gregorio in Conca; so, after the tasting, you can play the “Gioco della Zara”, a typical game with many references to Dante: rolling the dice you can easily win lots of books, gadgets and typical products. You can also do the LECTURA DANTIS for free.